The Huawei P30 Pro is days away from launching, but there have been a ton of leaks detailing pretty much every aspect of the phone. Amazon’s Italian website released its listing for the handset, as well as the P30 Pro’s lower-cost alternative, the P30, revealing that the phone is scheduled to go on sale on April 5th. The listing prices the device at €1028.19 (roughly, $1,561.71 CAD) making it more expensive than the Mate 20 Pro. In Canada, the P30 Pro retailed between $1,199 to $1,315, depending on the carrier that sold it. Inside, the handset features Huawei’s 7nm Kirin 980 chipset. This is the same chip that’s in the Mate 20 Pro. The back of the P30 Pro features four main cameras, while on the front of the phone there’s a single camera for selfies. The leaked promotional material even says the phone has a 10x hybrid zoom, which improves on the 3x zoom on last year’s P20 Pro and Mate 20 Pro devices. Likewise similar to the Mate 20 Pro, the phone will feature an in-display fingerprint sensor, thus removing the capacitive fingerprint scanner from last year’s P20 Pro. It’s also launching with EMUI 9, 8GB of RAM, 128GB of storage and a 4,200mAh battery, according to Phone Arena. The device also looks to be following in the footsteps of the Essential Phone and the OnePlus 6T with a small notch that only houses a front facing camera. Finally, the leak shows off the colours of the phone. 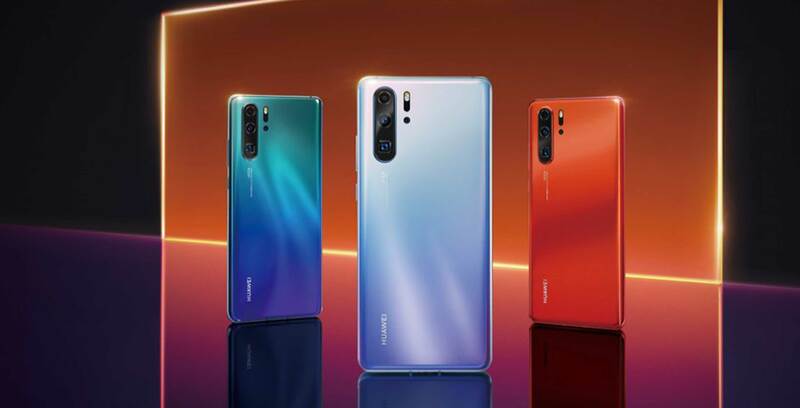 Huawei is sticking with the shiny gradients that it used on the P20 series and the Mate 20 Pro, but this time around there’s a striking red option and a pearl-coloured blue hue. The teal-ish blue colour is still around, and of course, so is black. Huawei will officially unveil the phones at an event in Paris on March 26th.